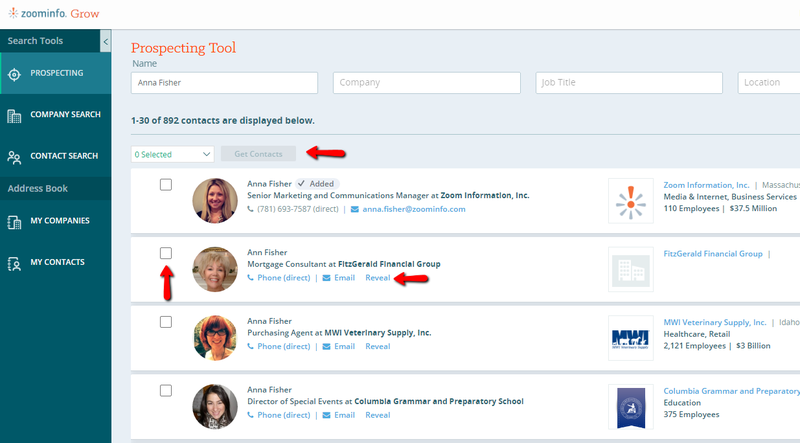 There are two ways to use the prospecting tool. 1). To look for a specific person. 2). To look for contacts meeting specific criteria. If you are looking for a specific person, enter their name, company, job title and location in the search fields pictured above. You do not need to fill in every search field, but the more you fill in, the more specific your results will be. If you are not looking for a specific person, simply fill in the criteria you want your search results to include. For example, you could search for marketing managers in Boston, Ma. Once you enter your search criteria, press enter or click “Find Contacts.” Your results will populate below. To reveal a contact's phone number and email addresses, scroll down to the appropriate profile then click the word "Reveal" located next to the email icon. If you want to reveal the information for multiple contacts at the same time, click the checkbox next to each profile you wish to select and then click the button above your search results that says "Get Contacts." If the phone number we have for a contact is a direct line, the word “direct” will appear next to the number as it does in the photo above. If you do not see the word “direct,” the phone number is for the company headquarters where the contact works. Upon revealing contact information, one credit will be deducted from your account. Please note: The export to Salesforce option is reserved for Grow members with a Business plan subscription.